Montebello Armenian Genocide Monument. © Hagop Bedrossian. Orange County Armenian Genocide Monument. List of Armenian Genocide Monuments around the world. On August 19, members of the Armenian cultural union Nairi and a group of men, accompanied by the Iranian Armenian Mountaineers went to Jan Ston Field. They placed a memorial plaque in memory of the 90th anniversary of the Armenian Genocide. In the Armenia diaspora the little public art we have is largely consisted of memorials dedicated to teh victims of teh Armenian Genocide of 1915. There are 139 Armenian memorialscommemorative plaques, inscriptions and monumental sculpture throughout the world, the most well-known of which is the Genocide Monument (1968) in Armenia's Dzidzernagapert Memorial Park designed by architects S. Kalashian and L. Mkrtchian. There are 27 other Genocide memorials in Armenia. That number is exceeded only by the memorials in France, 35 in all. The United States has 21, Lebanon has 5, while Uruguay and Venezuela have one each. Other countries with Genocide memorials include Poland, Belgium, Austria, Switzerland, and Italy, among others. A MONUMENT TO ARMENIAN GENOCIDE VICTIMS SET UP IN FRANCE'S LILA TOWN YEREVAN, MAY 23, ARMENPRESS: The Armenian foreign ministry press office reported that in France's Lila town a cross- stone, commemorating the memory of 1915 Armenian genocide victims. The opening ceremony was attended by the mayor of Lila, Jean Jacques Salle, Armenia's ambassador in France, Edward Nalbandian, state and political leaders, as well as by the clergy and representatives of the local Armenian community. On that day Armenian flags were hoisted on Lila's town council and streets. 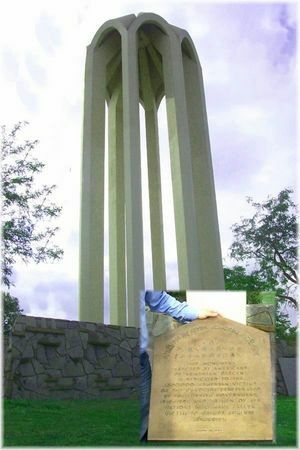 The Armenian ambassador noted France's recongnition of the Genocide, "The fact that there are numerous monuments dedicated to the victims of Armenian genocide in France's territory proves that the genocide has been acknowledged by its citizens,"
On Oct 10, 2005, Fresno Mayor Alan Autry announced his commitment to build a monument in the near future dedicated to the memory of the victims of the Armenian Genocide. YEREVAN, MARCH 30, NOYAN TAPAN - ARMENIANS TODAY. Opening of a memorial complex dedicated to the memory of the Armenian Genocide victims will take place at the Bomon distict of the city of Marseilles on April 24. Gilbert Kerkerian, the Deputy Mayor of Marseilles informed about this at the March 29 meeting with the Armenia-France Friendship Deputies' Groups. It was mentioned that the French Government which allocated one million evros, implements building of the memorial complex, and the author of the idea draft is the Marseilles-Armenia Association. The Tsitsernakaberd memorial complex became a source of inspiration for building the memorial complex: it will be engraved in French and Armenia on the monument: "In the memory of 1 mln 500 thousand Armenian became victims of the first genocide of the 20th century conducted by the Turkish government in 1915." Petros Mashughian, a member of the Marseilles-Armenia Association mentioned that four flags will be placed in front of the memorial complex: France, Armenia, the European Union and the city of Marseilles. It was also mentioned that the assistance shown by Jean-Claude Gaudin, the Marseill es Mayor, the First Deputy Chairman of the Senate is great in building the memorial complex. Mher Shahgeldian, the head of the Armenia-France Friendship Deputies' Group appreciated the Armenian-French friendship, considering opening of the memorial complex symbolical, as the Year of Armenia is marked in France this year. He also attached importance to the contribution of the Armenian community in Marseilles and the Marseilles-Armenia Association in the issue of building the memorial complex . As Noyan Tapan was informed by the RA NA Public Relations' Department, other issues relating to the Armenian-French ties and of bilateral interest were discussed at the meeting. The following table shows the major memorials around the world dedicated to the memory of the Armenian Genocide victims. The Armenian Genocide museum at Der Zor, Syria. In 2010 was erected in Mislata (Valencia) in Spain the first monument commemorating the Armenian genocide. The sculpture, three meters high, is in the gardens of the Garden of Sendra, in the old town. Translation - To the memory of 1,500,000 Armenians, victims of the 1915 genocide perpetrated by the government of the young Turks in the Ottoman Empire - this memorial is in Arles, Provence, France. This page was last edited on 15 October 2018, at 05:24.